Of all the features in your landscape, the driveway is likely the one installation that sees the most wear and tear. Not only does it have to endure foot traffic, but the vehicle movement, oil stains etc. take their toll too. This makes it crucial to choose good quality materials and hire experts for the installation of this feature. We at Emerald Creek Landscapes, LLC are a well-established company in the landscaping field and have been serving customers in Ringgold, East Brainerd, and Fort Oglethorpe. Our experts have successfully completed a large number of paver driveway design and installation projects across East Ridge, Dalton, Chattanooga and Red Bank as well. We have also catered to customers in Middle Valley, Cleveland, Soddy-Daisy, Calhoun and the surrounding areas and created beautiful driveways on their properties. Concrete - These pavers are widely used in driveway installations. Not only are the extremely resilient and strong but are available in a wide array of styles, shapes, sizes, colors, and finishes. You can use different shapes and combinations of colors to achieve the look you want on your property. You can also opt for interlocking concrete pavers that are perfect for a driveway; the interlocking pattern enhances the integrity of the feature. 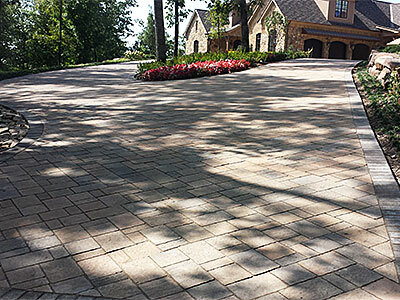 Brick Pavers - No matter where these pavers are installed, they lend a classic and elegant look to space. Today, you also have the option to choose from outdoor brick paving of different colors, shapes, textures, and styling to create the look you want on your property. Like stone paving, these are also very long-lasting, durable and easy to maintain. Natural Stone Pavers - These are extremely rugged, look great and are available in a variety of colors, shapes, and sizes. They are very easy to maintain, the installation is quick; when installed by experts, these features can last for decades without any trouble. You can choose from stone paving made of slate, travertine, bluestone, flagstone etc. While the cost of stone pavers is higher than that of brick or concrete, in the long-term the cost of ownership is lower, which provides you value for money. With the vast experience and expertise we have developed over the years, we know what it takes to provide excellent solutions at very competitive paver driveway cost. Only the best materials and workmanship are used in the work and this ensures your brick paved driveway will last for a number of years with minimal maintenance. You also have the option to get the surface of the paving seal-coated as this will make it scratch and stain-resistant. We customize our solutions so that you get the kind of driveway you need. For any more information on our services or to discuss your project details, feel free to call Emerald Creek Landscapes, LLC at 423-593-5443. You can also send us your queries and project details via this online form.